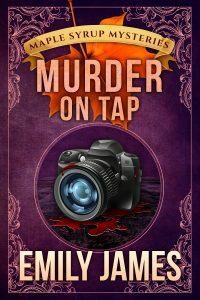 The second book in my Maple Syrup Mysteries series will be coming out very soon (December 1, 2016). 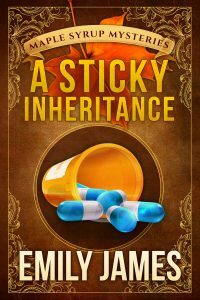 Now’s the perfect time to read Book 1, A Sticky Inheritance, if you haven’t already. When we got the call about my Uncle Stan’s death and I decided to make the ten-hour drive to arrange his funeral since my parents refused, I hadn’t counted on two things. How much colder Lower Michigan was even in October than Northern Virginia, where I grew up. If it weren’t for the freakish number of tractors using the roads up here, I wouldn’t have been speeding, an hour behind schedule, and I certainly wouldn’t have ended up stranded on the side of the road with a flat tire and a car that now sounded like it was trying to digest a stomach full of rocks. When the tractor had been coming toward me, hauling a contraption with long spikes behind it and taking up my half of the road as well as his, the logical thing to do seemed to be to swerve out of the way. I hadn’t realized at the time that the driver would move over at the last minute to let me safely by. I hadn’t even known if he could see my little Acura from his perch. And who could have predicted that the gravel shoulder would be so soft, dragging me sideways into the edge of some farmer’s field? I squatted as well as I could in my pencil skirt and peered under the back end of my car, next to the flat tire. Rusty wire fencing wrapped around the other back wheel, and a wooden post had jammed itself up into the metal that connected the wheel to the rest of my car. My car wasn’t going anywhere. Not on its own, anyway. I picked my way back to the more solid ground near the edge of the road and pulled my cell phone from my purse. Before I could dial, a charcoal-gray pickup truck eased to a stop in front of me. 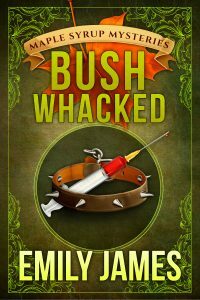 The passenger-side window rolled down, and the man behind the wheel leaned toward it. From what I could see, he looked to be a little older than me—maybe early to mid-thirties. His dark hair and vivid blue eyes reminded me a bit of a young Patrick Dempsey. I’m a regular at the women’s self-defense classes at my gym—they’re a great workout, not to mention that every woman should know how to protect herself—but even with that, climbing into a vehicle with a stranger in the middle of the boonies would be stupid. My mother raised me better than that. I glanced at my phone. Two bars. It would be a crap shoot whether I could hold a signal long enough to call for help. Thunder growled in the distance, and a few drops of rain spattered my face. No way was I walking. My arms were already covered in goosebumps inside my coat. I’d probably freeze to death before I made it to town. I backed one more step toward my car just in case he wouldn’t take no for an answer and I had to hop inside. Not that I could drive away, but at least I could lock the doors. A little worm of guilt wriggled around in my stomach. He probably was simply a Good Samaritan, but I was a criminal attorney, the daughter of two criminal attorneys. I knew too much about the evil in the world to risk it. He tipped his head, rolled up the window, and drove away. I shivered and slid back into my car. The empty stretch of road suddenly felt a lot emptier. For the next hour, I tried unsuccessfully to reach AAA or anyone who might be able to call a tow truck for that matter. Just when I was about to admit defeat, dig out a better pair of walking shoes, and brave the cold, a tow truck stopped next to my car. If I ever saw my Good Samaritan again, I probably owed him a thank you—and an apology. Fair Haven apparently had two options for car repairs—Quantum Mechanics and Fix-A-Dent. Since I had no idea how to choose between the two, I took the tow truck driver’s advice and went with Quantum Mechanics. They were a little pricier, but better at fixing the “guts” of a car, as the driver put it. If I’d learned anything from my dad, it was that you get what you pay for, and given the sound my car was making, chances were good that post had punctured more than my tire. I handed the signed papers across the counter. The bald man on the other side wore the greasy powder-blue jumpsuit that seemed to be the uniform for this place. His nametag read TONY. Tony scooped up the papers and turned away. He smelled more like gasoline than a gas station did. He cleared his throat and I could tell the touchy-feely part of the conversation was officially over. That was okay with me. If I was going to manage all of this on my own, I had to stay focused on the practical details and not on what I’d lost. His directions contained at least five streets named after trees. Directions had never been my strength, and it figured that my GPS system was integrated into my car. I repeated the names over in order as I hauled my large, wheeled suitcase out the door. The town screamed tourist destination. Not only were the streets unnaturally clean, but most of the clearly visible walls had been painted in such a way to be discussion pieces. Some of them made the buildings look like they’d been cracked open, giving you a peek inside at some upside down world, a jungle environment, or the inside of a pharaoh’s tomb. Others sported mountain vistas that belonged in an art gallery. By the time I passed Maple, Chestnut, and Pine Streets, I was lost. If Tony had given me directions based on the names of the stores, finding the funeral parlor would have been simple. Each store front carried a sign with a quirky name—Burnt Toast Café, The Sweet Tooth, Sew What Clothing and Shoes, A Salt and Battery (which from a glance in the window looked to be a restaurant specializing in fried fish), and Indiana Bones: Temple of Groom (with a giant smiling schnauzer face painted on the front window). The tourist board must have helped each business out with a name because there was no way everyone in this town could be that creative. Cavanaugh Funeral Home should stand out from the normalcy of the name alone. Thankfully. If I’d gotten a call from a Deepest Holes Funeral Home, I would have drained my savings to fly Uncle Stan back to Virginia. Unfortunately, I didn’t see it anywhere. I dragged my bag into the nearest store, a hair salon called The Chop Shop. The inside had 50s-style décor, right down to the checkerboard floor, alternating aqua and red chairs, and polka-dot dresses on the hair stylists. I could definitely see the appeal this town would have for vacationers, but it must be a little odd to live and work here. I didn’t mean to eavesdrop, but I couldn’t help catching snatches of the local gossip. A brewer was in some kind of trouble with the law. Again. John Somebody’s granddaughter was pregnant at sixteen. But that was no surprise since her mom was only a year older when she had the girl. And apparently there was an ongoing feud because Norma’s neighbor’s dog kept pooping on her lawn. That was something else you didn’t see in the city. Not the dog poop. We had plenty of that, even in an urban area. The gossip and sense of closeness. I barely knew my neighbors. I could be impregnated by an alien and no one would be the wiser. “You’re new,” a little voice said. I swiveled around. A seven-year-old boy sat cross-legged on the floor, surrounded by trucks. For a second, all I could see was myself at his age. My parents always seemed to have to work late, and so Uncle Stan’s receptionist would pick me up at school and I’d play in a corner of his office until he finished with his last patient or my parents finished with their case preparation. I guess they figured I was safer around heart patients than I was around accused criminals. He made a swooshing vroom noise. “My mom probably does. She knows everything. She even knows how to make Rice Krispy squares.” Awe filled his voice. He nodded this time and crashed a plastic dump truck into the side of the sofa, complete with crashing sound effects. “Can I help you?” a woman’s voice said. From her dark hair and eyes that matched the little boy’s, this must be his mother. Liz gave me directions, using landmarks this time, and I backtracked two streets. Once I turned down the right road, the funeral home was easy to spot. The sign was clean and simple. The stone was a muted gray. Walking backward, I dragged my suitcase up the stairs and inside, kicking myself that I’d never been good at packing light. I smashed straight into a solid mass. A man’s voice grunted an oomph. Warm hands grabbed my upper arms and stopped me from toppling over and making a complete fool of myself. Heat burned up my neck, and I righted myself. A lawyer must always be poised and professional, Nicole. My mother’s familiar lecture played in my head even though she wasn’t here to see me make a clumsy mess of something this time. 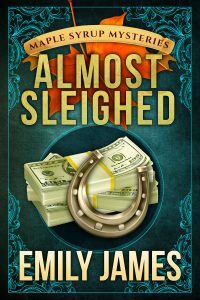 I smoothed my skirt and looked up at the man I’d nearly plowed down. It was my Good Samaritan.